I could tell just from the title, these were going to be GOOD. Each month I am excited to get the newest Williams-Sonoma catalog, because it is full of both kitchen equipment for me to drool over as well as delicious sounding recipes. Williams-Sonoma is one of my most trusted recipe sources. 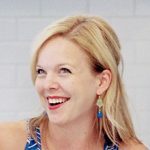 I have made an unbelievable number of things from their website, cookbooks, etc. and have had only one or two that were less than superb. So this month when the catalog came, I quickly folded down the pages of all the recipes I wanted to try and these waffles were right at the top of my list. These were a delicious Valentine’s breakfast for us (we made a half batch). I had no issues with the recipe and wouldn’t change anything for next time. They may be slightly more involved than your usual waffle recipe, but are totally worth it in my opinion. Can’t wait to have them again! To make the caramelized apples, in a skillet over medium-high heat, melt 3 tablespoons butter. Add the apple slices, sugar, cornstarch, cinnamon, nutmeg and salt. Mix until apples are evenly coated. Cook about 18 minutes, stirring occasionally. Remove skillet from heat and stir in vanilla. Set aside. To make the waffles, in a large bowl whisk together the egg yolks, buttermilk, melted butter, and vanilla. In a medium bowl, sift together the flour, baking powder, baking soda, sugar, cinnamon, nutmeg and salt. Whisk the flour mixture into the yolk mixture until smooth. In another clean bowl, beat the egg whites on medium-high speed until stiff peaks form, about 1 minute. Gently fold 1 cup egg whites into batter; carefully fold in remaining egg whites. Preheat waffle maker on medium-high. Pour 1/3 cup batter into each well of waffle maker; close the lid. Cook 5-6 minutes. Repeat with remaining batter. 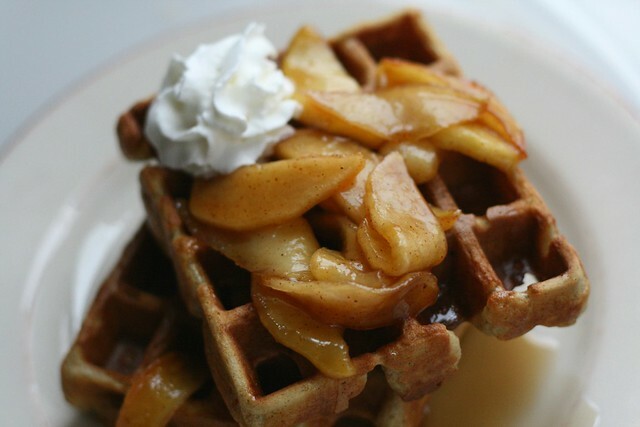 Serve waffles with caramelized apples and whipped cream.